Options: 4 lb. 8 lb. Formulated to specifically meet the needs of kid goats, including pygmy goats. Made with high quality milk proteins for excellent digestibility. 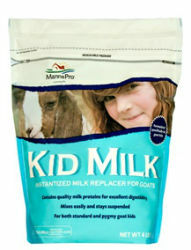 Kid Milk Replacer is an instant powder, that mixes easily, and stays in suspension-no clumps with this product. A cup* is provided in each Kid Milk Replacer bag. Mix one enclose cup of Kid Milk Replacer Powder into 1½ pints of warm (110o F) water. The following amounts of reconstituted milk replacer should be fed daily, as indicated by the chart. 1. Whenever possible, provide kid with at least one feeding of colostrum from the doe, preferably within two hours of birth. If the doe cannot provide colostrum, use Manna Pro® Colostrum Supplement. 2. Provide fresh, clean water free choice at all times. 3. Temperature of reconstituted milk replacer delivered to the kid should be 90-100oF. Dried whey protein concentrate, dried whey, dried whey product, animal fat (preserved with BHA, BHT, citric acid and ethoxyquin), lecithin, ethoxylated mono-diglycerides, propylene glycol, calcium carbonate, l-lysine, dl-methionine, sodium silico aluminate, dicalcium phosphate, ferrous sulfate, manganese sulfate, choline chloride, vitamin E supplement, vitamin A supplement, zinc sulfate, maltodextrin, vitamin D3 supplement, magnesium sulfate, ascorbic acid, niacin supplement, biotin, calcium pantothenate, copper sulfate, vitamin B12 supplement, sodium selenite, folic acid, riboflavin supplement, thiamine mononitrate, cobalt sulfate, menadione sodium bisulfite compex, pyridoxine hydrochloride, artificial flavors.